Ireland, 2017-May-24 — /Travel PR News/ — John Burke returned to a rousing Shannon Airport and Co. Clare welcome today (22 May 2017) and dedicated it to his wife Aoibhín and the cause the couple have championed – encouraging young people through personal challenges. 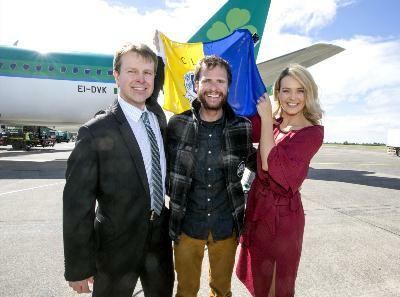 Just six days after he became the first Co. Clare man to reach the summit, the 38 year-old said that he would never have achieved his goal without his wife Aoibhín’s encouragement and support. The couple’s motivation for John taking on the challenge was the hope that it would act an example to young people to chase their dreams. The proprietor of one of the Wild Atlantic Way’s best known hotels, the Armada Hotel in Spanish Point, and his wife Aoibhín have established a charity, Elevate, to promote wellbeing among young people and provide encouragement to them to reach their potential and follow their dreams in life. And on his return at Shannon Airport, he said that the mental health of young people and the challenges posed by blunt end of social media are amongst the greatest issues facing Ireland today. “I owe everything to my wife Aoibhín for supporting me on this as it was a huge sacrifice for her to make and suffice to say that her gift of golf clubs is a hint that’s not lost on me,” he quipped. “I clearly wanted to prove something personally in making it to the top but the big reason for this, and it’s not unrelated, is that I wanted to send a message to young people that they all have the potential to achieve in life. There will be hills to climb along the way but they just have to hang in there and their day will come for sure. “Growing up I didn’t achieve in GAA like others did and GAA was the only real thing back then for us in West Clare. But I have proved in doing this that here’s something for everyone. “Young people, in particular, really need to believe in that because right now they are probably more challenged than ever. Research has shown that one in five young Irish adults between the ages of 19 and 24 and one in six young people between 11 and 13 have mental health issues. “There’s a variety of reasons for that but certainly social media is one of them. Social media is a magnificent platform for getting positive news out but it can destroy young people in an instant, especially those going through a difficult stage. We really need to tackle that and it’s a big question but something has to be done. “As a family we had our own tragedy with a mental health issue and that has spurred Aoibhín and I to establish Elevate. We’re not going to change the world with it but it’s our contribution and climbing Everest has given us a platform to raise awareness in Clare about this issue.” With the charity the couple hope to raise funds for different wellbeing promotional initiatives, including workshops in Clare secondary schools – the first one starting in September – that will target raising self-esteem of young people through different medium, including song and dance. John was greeted on arrival at Shannon by over 200 supporters from across Clare, with busses having left the Armada Hotel and Doolin, where he is a co-owner of the popular Hotel Doolin. He flew back to Shannon from Kathmandu via Abu Dhabi and Heathrow, landing in Shannon at 4:05pm with Aer Lingus. This entry was posted in Adventure Travel, Airports, Business, People, Travel, Travelers and tagged Aoibhín, Everest mountaineer, John Burke, Shannon Airport. Bookmark the permalink.